The flowers were finally starting to grow in the spring of 2008. I was finishing up my undergraduate degree in Dietetics, working as a personal trainer, and quietly struggling in life. It’s very easy to show the world what they want to see, but really on the inside, I was withering away. My self-destructive eating disorder, which led me down the path to be a dietitian in the first place, was out of control. I would exercise at the gym every day, or teach my group exercise classes, but in order to eat I had to workout and as a punishment for over eating I had to workout. I tried so hard every day to work on forward progress. I was finally in the recovery process. I was eating a cookie at work – finally – and another trainer turned to me and said, “maybe you should stop eating so many cookies.” I was heartbroken. Finally eating sweets and on the right track and now I’m judged for it. I made the decision that night to not workout at the gym. This was mind-blowing because what else am I going to do!? Alright. I’ll go for a run. 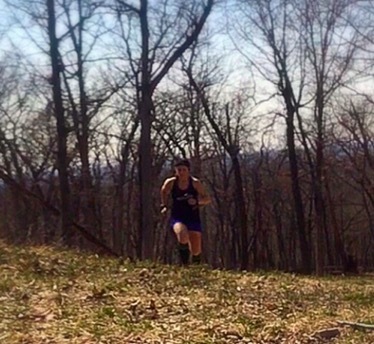 Let me rewind to my entire life….I have never been a runner. I was playfully made fun of on the soccer team in high school and college for not being able to run and basically causing the whole team to do more sprints…quite often actually. I was in good shape but didn’t see the point of running unless chasing something. I stood by my claim that running is ridiculous unless chasing something until that evening in spring 2008. I went for a run. It wasn’t long….It wasn’t fast….and I was wearing umbros (need I say more?!). I got back home and I felt an overwhelming sensation. I absolutely loved it. So I kept going on these slow runs here and there. I decided shortly after starting that a half marathon should be on my life bucket list. By fall, I did a duathlon in Green Bay – it was SO hard, but I did it. I don’t care much for cycling when I have to pay attention to the road, I decided. It wasn’t long after, and I was still only running a short distance here and there, that I would do a half marathon. I didn’t have a GPS watch; I was wearing soccer shorts and cotton tee shirts; and my shoes were off the sale rack at Kohls. I “trained” for maybe 4 weeks beforehand. And toeing the line in my umbro shorts…I ran a 1:40 for my first half marathon earning me an age group award. I don’t think I have ever been more proud of myself…given I was called Weasel in high school for not always doing the whole sprint drill! This race set the tone for the next 8 years and counting. I’ve raced the Boston Marathon, New York Marathon, and countless others with a half PR of 1:26 and full PR of 3:05. What happened to the weasel?! Something so awesome, something that had been hiding within me for probably so long; this hidden talent….completely masked by my need to calorie count, not consume anything, and keep pushing my body to hate itself…was finally revealed. Why is body image that important to people? This realization within me probably hit a little too early as I was dealing with the demons in my life – but I am proud to have the road racing experience that I had regardless of not reaching the goals I set for myself. I am a successful ultra-runner now with even bigger goals than before and today, I can say I truly believe they will happen. Now some may say, ‘oh you started running to hide or run away from something.’ No. No I really didn’t. I took care of my internal demons the appropriate way and now live a fulfilling life of pizza, veggies, desserts, and anything I want at a healthy weight FOR ME. As an athlete, I had to learn how to support MY body and MY mental state with exercise and with food. It was a long journey to get to this point, but it can be reached. Running is a great outlet, but ensuring you do it for the right reasons is so important. Being independent of others training, habits, and food rules is so important. My running story is unique to me and I hope you have a running story to call your own as well. It’s so easy for athletes, especially runners, to fall victim to overtraining because of the euphoric nature of the running high; and to fall victim to society’s claim that we all need to be thin, or toned, or that there are good foods and bad foods. No. None of that exists. Why can’t we just be ourselves with no judgments, and no rules. I see way too many people living the life of another person, of another diet, or of another exercise plan. Do what’s best for YOUR body and internal self. Everyone has demons, but I promise you, giving them up is the best thing in the world. This is my running story and I stand by it – I’m proud of it – because without this story, I would not be the runner I am today. Blog author: Annie Weiss, MS RD; ultra-endurance athlete and dietitian living and training in Milwaukee, WI. She is a sponsored athlete/ambassador for AltraRunning, Swiftwick Socks, The OrangeMud, and Fluid Nutrition. Follow her training/racing on Twitter & Instagram: ani_weiss and Facebook: Ani Weiss.